MLRRC Club Car - series 2 for 2019! OUR 25th Club car series 1 SOLD OUT quickly in 2018. OUR 25th Club car series 2 has also sold out in 2019. Add excitement to your “fallen flags” roster with this Milwaukee Road 2-Bay Wood Chip Hopper 3-pack set. These cars will be identical to the 2018 Series 1 cars except they will feature three new car numbers. There will be significantly fewer Series 2 cars produced than the sold out Series 1 production run. If you already ordered the Series 1 set, you can add the Series 2 set and have a string of six uniquely numbered Milwaukee Road wood chip hoppers! While three-bay hoppers were very popular on many railroads including The Milwaukee Road, no 2-bay hoppers were ever built by the railroad. The Milwaukee paint shop could have used this unique design to promote its image across the country. All ten original cars (numbered 372000 through 372009) were built in 1928 as coal hoppers and were rebuilt in 1963 as wood chip hoppers. They remained in service through the 1970s. These classic hoppers were developed in association with the Milwaukee Road Archives and the Milwaukee Lionel Railroad Club, Inc., and will be manufactured as LionScale cars by Lionel, LLC. Each car will feature die-cast sprung trucks and magnetic operating couplers. This is a very limited edition club car set. Order now! Minimum O-31 curve. Length for each car is 8 ¾”. Cars will be available as a 3-car set with one of each number or as individual cars as available (sorry no car number guarantee). Priority will be given to 3-car set orders. Due to demand for the 2018 Series 1 sets, very few one-car orders were filled. Orders for the sold out Series 1 cars are shipping in late March 2019. Projected delivery for Series 2 cars is November 2019. Make checks or money order payable to Lionel Railroad Club, Inc. This car was developed by the members of the Milwaukee Lionel Railroad Club to promote Breast Cancer Awareness. In 2007, Wisconsin & Southern created a car promoting the strides against cancer, and it rode the area rails. No expense was spared in making this prototype car special. It was completely sandblasted, and an epoxy primer coat was applied before the durable urethane color coat. The roof was also treated with a urethane silver coat to help prevent rust from bleeding down the sides. Our car is manufactured by Lionel LLC, based on their PS-1 boxcar. It features sprung metal trucks with operating couplers, hidden uncoupling tabs, metal brake wheel, separately applied metal underframe details, opening doors, light gray roof, pink car body color similar to the Lionel Girls set hopper, and distinctive Milwaukee Road markings to continue the fallen flags series/theme. This unique Milwaukee Road boxcar design was found in the musty cellars of the Milwaukee Road Archives and given to the Milwaukee Lionel Railroad Club to share with you as a limited-edition Lionel boxcar. In the late 1950's young Milwaukee Road graphic designers in the engineering department were ahead of their time with designs for freight cars. This example, called the "Big M" logo design, was judged to be too modern to run the rails at that time. The design was filed away and forgotten, potentially lost forever. But now, after more than 50 years, volunteers found the original drawing of this unique design, which we are offering to you on a O-27 traditional double-door boxcar. 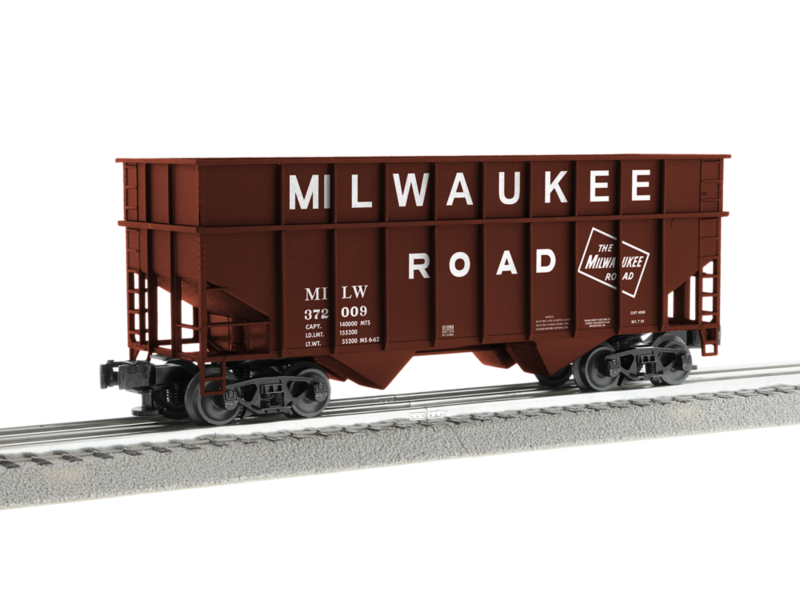 This classic boxcar was developed in association with the Milwaukee Road Archives and Milwaukee Lionel Railroad Club members and will be manufactured by Lionel LLC. The car features die-cast sprung trucks with magnetic operating couplers and a metal base, door guides, and brake wheel. Limited production. Add excitement to your “Fallen Flags” train collection with this CMStP&P “Round-Roof” single-door boxcar. The prototype was originally built in 1933 by the PRR, with many railroads following suit. The design was adopted by the American Railway Association (ARA) which became the Association of American Railroads in October 1934. This boxcar was built through the 1960s. The Milwaukee Road rebuilt a wrecked boxcar in 1934 as a test to determine if they could build a welded steel boxcar like the round-roof. Only one was built which employees called the “Wagon Top”. Because of the high cost and excess weight of this car’s steel shell, the Milwaukee car shops came up with a better design which was the beginning of the rib-sided boxcar which was used well into the 1970s. This classic scale boxcar was developed by the Milwaukee Lionel Railroad Club in association with the Milwaukee Road Archives and was manufactured by Lionel, LLC. The car features die-cast sprung trucks with magnetic couplers, and die-cast frame and metal brake wheel. This is a very limited-edition club car, only a few factory-sealed examples remain. Stay up to date with MLRRC activities. Click on the the heading on the left to check out our latest list of upcoming events. "The Milwaukee Lionel Railroad Club is an educational, non-profit, charitable, and benevolent organization of individuals participating in the spirit of good fellowship by preserving our nation's railroad heritage through maintaining, operating, and demonstrating toy trains in the joy of model railroading and providing educational opportunities concerning railroading, it's influence on history, and our nation's past, current, and future development." The Milwaukee Lionel RR Club was founded January 1947 by Jerry Brettschneider. Our club is the second oldest club in the state of Wisconsin. See a timeline of the Club's accomplishments. The club grew over the years, and finally it had to move from Jerry's parents basement to its first formal club headquarters in 1975 located at N 79 St and Burleigh St. In 1984 the club had to find larger quarters, so it moved to 10236 W. Fond du Lac Ave, Milwaukee. Finally in March 2002, the club purchased its own commercial space, and moved to 2721 S. Calhoun Rd, New Berlin, WI. Several Lionel Layouts are built, which features the Hellgate Bridge, that carries track for Standard Gauge and O Gauge Trains. This bridge was featured in many local newspapers, and in Classic Toy Train Magazine. Other programs and activites that the club is involved in is Operation Lifesaver, The Boy Scout Merit Badge Program, maintains a large 12 by 32 foot portable layout, and two smaller layouts for community programs. A very popular All Gauge Train Swap meet has been run by the club since 1976. The event is currently held from the months of October thru March, at the Clarion Hotel - Milwaukee Airport, 5311 S. Howell Ave, WI 53207. Held generally on the 3rd Sunday each month, from 8 a.m. to Noon. Check the calendar for exact dates. 1947 Club forms and first layout begun in basement of founder's parents home. 1971 Particpates in first Milwaukee area "Trainfest" show sponsored by the local division of the National Model Railroad Association. 1972 Organizes first shopping center based model railroad show at Southgate Mall. 1976 Club incorporates in Wisconsin as a "not-for-profit" educational organization. 1977 Holds first "Round Robin" tour of member's home layouts. 1982 Club President organizes "Association of Model Railroad Clubs" (A.M.R.C) to promote and coordinate local model train shows. 1984 Club moves from Burleigh Street to larger space at 10236 West Fond du Lac Avenue. Constructs and scenics a large layout for simultaneous operation of five trains. 1996 First participation in local public television's annual fund drives. 1987 First participation in local museum and zoo holidayexhibits. 1998 Club receives 501(C)(3) tax-exempt status for all donations. 2002 Club purchases and moves to a permanent location in New Berlin, Wisconsin. 2007 Layout constructuion continues in new quarters with three large layouts, including a Standard Gauge loop and Hellgate Bridge. Club celebrates its' 60th Anniversary with various events throughout the year. 2009 Acquired 500+ piece antique toy train collection.